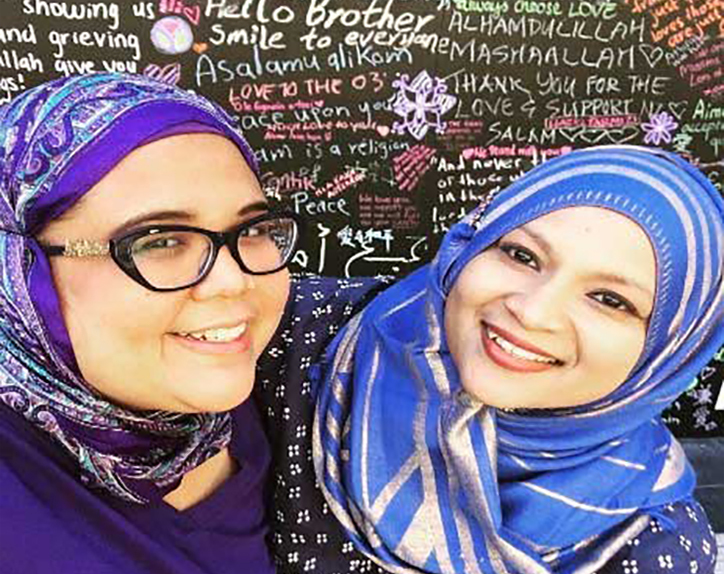 Haezreena Begum binti Abdul Hamid (right) with Dr Bianca in front of the tribute wall in Tim Beaglehole Courtyard. Assalamualaikum warahmatullahi wabarakatuh which means ‘May the peace, mercy, and blessings of Allah be with you’. I write with great sadness over the horrific attack that happened on Friday 15 March 2019 in Christchurch. As a Muslim woman living in New Zealand, I am aware of the exaggerated focus on Islamic extremists by the global media and the anti-Muslim sentiment that have caused racial sentiment, fear, hatred and discomfort towards Muslims. This narrative of hate and division was built on year after year, leading up to the Christchurch attacks that stole 50 innocent lives in an act of terror that simply cannot be accounted for. To be honest, I wasn’t totally surprised with the attack but felt deeply shocked and saddened because my brothers and sisters were gunned down while they were praying at the mosque. They were totally defenceless and were at their most vulnerable stage at the time of the attack. In case some of you were wondering, we refer to each other as brothers and sisters in the Muslim community because we regard ourselves as one big family. It gives us a sense of unity and a sense of belonging. My sons would perform jummah (congregational prayers) at the Kilbirnie mosque every Friday and we have also prayed at the Al-Noor mosque when we were in Christchurch a couple of months back. We could have been the victims but we were fortunate to not be at that place and at that time of the attack. The mosque is a sanctuary for us Muslims—it is a place of comfort where we seek solace, it is a place where we worship and seek refuge, it is a place of unity, and a place we feel at home. Therefore, we never thought that such a horrific attack could take place. 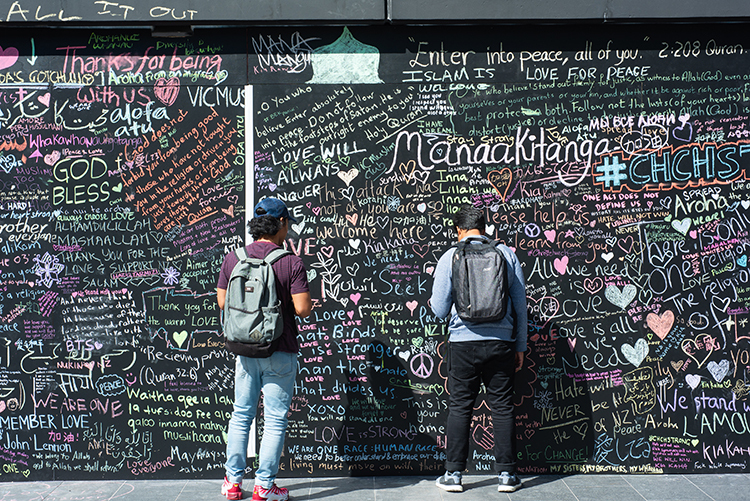 The tribute wall in the Tim Beaglehole Courtyard was filled with messages of love and support for Muslim whānau. Since Friday 15 March, I have received overwhelming support and love from family and friends which has tremendously helped me in overcoming my grief. The heartfelt messages written on the tribute wall in the Tim Beaglehole Courtyard at the Kelburn campus, the playing of the azan (call for prayer) as well as the two-minute silence have given me the comfort, security and assurance that we (the Muslim whānau) are very much loved and accepted as part of the New Zealand society. I was also approached by a few friends who were unhappy with the ‘Headscarf for Harmony Day’ saying that the hijab or headscarf is a symbol of oppression and tyranny. In this regards, I would like to clarify that although I am a Muslim, I do not choose to wear the hijab on a daily basis but I wore the hijab on that day to support the cause and show solidarity with my Muslim whanau. There were also mixed emotions from my Muslim brothers and sisters. Some were deeply saddened and shocked while some were telling me to stop grieving because those who were killed died as Shaheed (martyrs). Okay yes, they died as martyrs but that does not mean that I should not be allowed to grieve or feel sad. Shaheed according to the Islamic beliefs would refer to those who has been killed by any person unjustly and that their sins will be forgiven by Allah s.w.t and they will be admitted to Jannah (Heaven). The Muslims in New Zealand are a peaceful loving community and we are trying to get on with our lives. I hope that we will discard out feelings of hate and ‘otherness’ towards those who are of different colour, race and religion and see each other as equal. Inna Lillahi wa inna ilayhi raji’un. We belong to Allah and to Allah we shall return. Haezreena Begum binti Abdul Hamid is a PhD in Criminology candidate at Victoria University of Wellington.